Until recently, publishers didn't take e-books seriously because they only accounted for less than 1% of books sold. But now, according to Jonathan Kirsch, host of The Politics of Culture radio show, everyone in the publishing industry is paying attention to what he calls the "e-book revolution." He says it started with Amazon's kindle e-book reader--a product that did for e-books what iPod did for music. And last Christmas, e-book sales outnumbered print sales for the first time in history! In Jonathan Kirsch's radio show yesterday, he interviewed New York Times digital media columnist Motoko Rich, Wall Street Journal's All Things Digital blogger Peter Kafka, and e-book reader/fan and author herself, Dora Levy Mossanen about kindle, e-books, and ibooks. Where e-book readers used to be for early adopters, it appears they have migrated to the general public. And surprisingly, these adopters are not the young and tech savvy, a lot of them are in their fifties and sixties and simply love books. With over three million sales in e-book reading devices (e-book readers) it's surprising to me that I don't see people using them in the general public. You'd think I'd catch people reading in restaurants on their lunch break, in the doctor's office, or at a bus stop. But although e-book sales represent the fastest growing proportion of the publishing market, they still only represent about 5% of total book sales, according to Motoko Rich. Rich also says that even though e-book sales occupy a lot of mind space and are the leading cause of anxiety among publishers, it isn't the way the majority of the world reads. In fact, three million e-book readers is small potatoes compared to the forty plus million print sales. 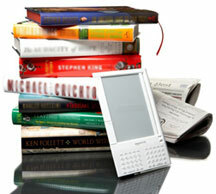 So what's the attraction to e-book readers anyway? Author Dora Levy Mossanen talked about how she loved the ease and speed of the kindle--being able to carry twenty books with her at all times to fill the small pockets of her day by reading, being able to download a book within 30 seconds from any location, and having her newspapers delivered to her each morning. On the downside, she missed having a book cover and an author photo, which she often sought out in her local bookstore. Will kindle stay on top? While kindle is the industry leader, Peter Kafka argues that a multi-purpose devise (such as Apple's forthcoming iPad)--with its ability for web browsing and video in addition to book reading--will eventually displace a single-purpose device (such as the kindle). But for readers, committing to one e-reading product is pretty much the only option we have right now. There are many e-book readers--Barnes & Noble's Nook, Sony's Reader, Amazon's kindle, Apple's iPad--but as far as I know, they have format issues and aren't truly compatible with one another. As far as reading quality, the kindle seems to be far superior except for the fact that it doesn't have a backlight option, like some others, which would be ideal for reading at night, say, in bed, where you'd still need additional lighting without waking up your hubby. For the book-buying audience, purchasing a new book at $9.99 as opposed to a hardcover print book at $24.95 is an attractive option. According to Motoko Rich, Amazon was actually losing money because they currently pay publishers a wholesale price that is about half the list price of a hardcover book, which typically ranges from $25-$35. So, Amazon was losing about $2.50-$4 every time they sold one of those $9.99 books. That freaked publishers out because they thought the $9.99 price was an eroding of value of what a new book was worth. NY publishing houses were concerned that they couldn't sustain the current business model that requires editing, copyediting, marketing, overhead, author advances, etc., so they wanted to take control of pricing. But they came to an agreement with Apple so that when the new iPad comes out in March '10, publishers will be able to set the consumer price according to hardcover book pricing. What that means to the book-buying public is that books bought on the iPad will most likely be a little more expensive than the kindle--approximately $12.99-$14.99. It's still less expensive than buying a new print book, but it will be interesting to see how current e-book buyers react to the increase. From an author and writer's standpoint, Dora Levy Mossanen says, with price points and publishing wars, she feels the pain for her writer friends who have a hard time finding a publisher in an industry that's turned upside down, but at the same time she recognizes the value of e-books and knows that the trend cannot be stopped. She feels that the new digital trends and formats allow authors to tap into an audience they might not otherwise reach. Another good point for authors and publishers is that with e-books they have very low overhead and no worry of book damage or returns, so that may make up for the reduction in price in the end. The e-book revolution is here and in full swing! I'm happy to be on the verge of a change in publishing and can't wait to see the advances in technology. Like anything, there will be a standard model set in place soon and e-book reading devices will become synchronized in formats in the future and, hopefully, will continue to offer low prices and eco-friendly options to hungry book lovers. Now, I want to know: do you read e-books? Do you have a kindle or another e-book reader? What's your preferred reading device?